I’m totally full of crap. But not on purpose! So, there’s that. Looking back, I’ve been wrong about everything. Looking forward, I see no reason to expect that to change. This blog takes sporadic snapshots of my ignorance, which is certainly interesting to me (if sometimes embarrassing). It includes musings on the world, technical tips and tricks, stories, and anything else I feel like putting down in prose. I hope that some of it turns out to be interesting, amusing, and/or useful to others. Before making use of any of those things, definitely read my disclaimer. In any case, this site serves as my placeholder on the Internet so that my colleagues, friends, and family can track me down even when I’ve grown tired of the world and burned down all my social media accounts. You can find me on Twitter, Facebook, and LinkedIn. For stuff related to Butterscotch Shenanigans, hit up the company’s contact form. My BscotchID username is BscotchAdam, and my Steam username is costerad. I’m a PhD scientist (Cell & Molecular Biology) now running a video game studio that I co-founded with my brothers. It’s called Butterscotch Shenanigans. To the studio, I bring a combination of intense skepticism, scientific rigor, and a love of problem-solving through programming. My work mostly surrounds building web infrastructure and software to automate anything and everything the company needs to do, as well as doing analytics and designing experiments to test our game design and business theories. Should you believe anything I have to say? Well, no. Not by default, anyway. But you shouldn’t believe anyone by default. I’ve done some interesting things and learned a lot, and plan to continue doing both, but there is an infinity of stuff I don’t yet know (much of which would undoubtedly invalidate that which I do “know”). I took a strange path to where I am today, and I wouldn’t take back any of it. I’ve summarized that path below, which might be of use as a reference for those who believe there is a right way to do things (hint: there isn’t). I am a graduate of the University of Chicago, where I received a B.A. in Biological Science. At the time, I was slightly offended that this was a Bachelors of Arts instead of Science. After spending a few years doing biological research I think they got it right. I finished college a tad early and spent a year working as a teaching assistant in the Biological Sciences Division of the University, trying to help non-bio majors (non bio-majors?) gain a basic understanding of biological concepts. I loved the teaching experience; having a captive audience for my ramblings on the awesomeness of evolution and genetics was wonderful. Unfortunately I did not have an opportunity to continue this teaching work, since my graduate institution lacked undergraduate programs. As a grad student, I satisfied the itch by cornering our analysts to explain all of the glorious details of the biological minutia I find so interesting. While in college I worked for a couple of years in Robert Haselkorn‘s lab on a drug-screening project in yeast. This resulted (years later) on the first scientific publication with my name on it. I would not say that the experience taught me much in the way of experimental design or data analysis (if only I could program as well then as I can now (or at all)), but it gave me a lot of confidence with bench work. My job was to grow 96-well plates filled with “humanized” yeast strains (creepy!) and then poison them with drugs to see how their growth was affected. I no longer recall how many drugs I screened, but I do remember that this was all done with a single-channel pipette, and that I ended up with a stack of 10 plates every week for a year and a half. I left with the impression that biological research was all about moving tiny volumes of liquid into other tiny volumes of liquid. My PhD work confirmed this theory. 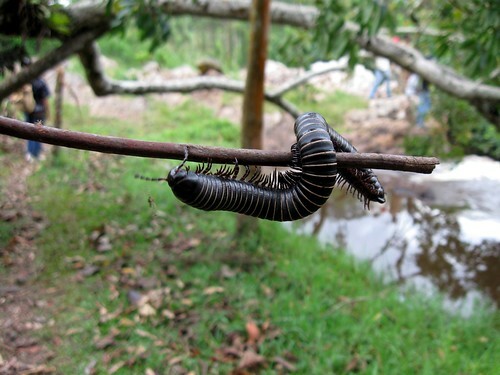 A millipede I found in a national park in Uganda. Almost as big around as my thumb. After my work in the Haselkorn lab and the subsequent year of teaching, in February of 2009 I went to Uganda for the Peace Corps, where I was supposed to be teaching high school science. Things didn’t work out and I came home after three months. Though the experience didn’t work for me, serving in the Peace Corps is often a wonderful experience and is certainly worth a look. It was Spring at the time I got back and I had no idea what I was going to do with myself, so I went into a joint venture with my middle brother (Seth) to start an online business, Mindforge Technologies LLC, to make custom computers. We had a lot of fun and learned a lot about the legal and financial aspects of starting a business, but we never made it past the startup stage, since Seth went back to school and I decided to get some more lab experience while applying for graduate school. During the Mindforge days I started teaching myself the computer programming language C++ through books bought from the Game Institute. I figured learning programming by making crappy games would be much more fun than standard methods. And it was! After those science-free but life-experience-full jaunts, I ended up in Justin Fay’s lab at WashU as a lab tech. My primary work there is yet unpublished (and, I suspect, will forever be) but comprised of another drug screen in yeast that yielded some neat results (that I can’t talk about until publication (if that ever happens)). I used my newly-developed programming skills to write software for data analysis. I was amazed at how much simpler my research life was when I could automate work tasks and simplify data collection, cleanup, and analysis, and so decided to take it further. I spent a lot of time learning Python and re-learning R so that I could more easily analyze the large datasets that I generated from drug screening. I rounded off my time in the Fay lab helping out with a short project measuring the toxicity of silver nanoparticles in yeast. We got a publication out of the deal, which I guess makes me a nanotechnologist. Or something. While I was at WashU, my girlfriend of 4+ years was at UT Southwestern for medical school. During my grad school interview at UTSW I met Steven Altschuler and Lani Wu, who wooed me with tales of cellular heterogeneity and computer vision. I decided during that visit to ask my girlfriend to marry me and to follow her to UTSW. After 4 years in grad school, with 3.5 of those in the Altschuler/Wu lab, I successfully defended my dissertation in July 2014 and so became a PhD in Cell Regulation. What does that mean? Well, I don’t think anyone knows, but it seems to be a synonym for “cell and molecular biology.” Apparently “cellular regulation” was the hot term for this in the 70s. I’ll eventually post my dissertation, but I have to respect the bizarre publication system of science and publish a final paper first. Anyway. My goals in the Altschuler/Wu lab were to straddle the worlds of experimental biology and computational analysis, and to that end I assembled a computational image analysis pipeline for microscopy data. Part of that resulted in a publication on microscopy image correction. It turned out that we, and everyone else, were not doing a great job of correcting optical artifacts in our images, and so I worked out how to do it. For my dissertation, I worked on a project to dissect how biochemical signaling pathways interact with each other. In short, human knowledge about cellular signaling seems to increase in complexity with every new publication, but I had a suspicion (some people call this a “hypothesis”) that this apparent complexity was, in part, an artifact of how we do science. This suspicion turned out to be correct, at least in my particular experimental case. I found that the supposedly-complex interactions between a set of signaling pathways were instead relatively simple. That work is finally published, which means I can freely toss my dissertation into the universe. Professor Blerg and his Gerblin-exploding potion. Made by Seth Coster. On the side, I had been working with my brothers on a joint venture, Butterscotch Shenanigans, on which they were working full time. Starting in August of 2014, I joined them full time. My main contribution to the company prior to that was my lead developer role in the game Gerblins! (which no longer exists). Finally, all of my remaining time is spent playing video games with my wife, reading SciFi novels, and taking on programming and statistics problems. I was wondering if you installed texmaker 1.8, I had some problems. I don’t recall. I’ve reinstalled my OS a few times since I got out of school, and haven’t had the opportunity to use LaTeX since. Whichever version I had though, I didn’t have any problems that were the fault of the program. interesting blog. Keep the good job up. nice area you’ve set up here! eat mints! this place is amazing! I could wander around here for weeks! Amazing site, Adman. With rather complicated content, I might add.